Event • Broadway/300 South comes alive without autos for three-plus hours. 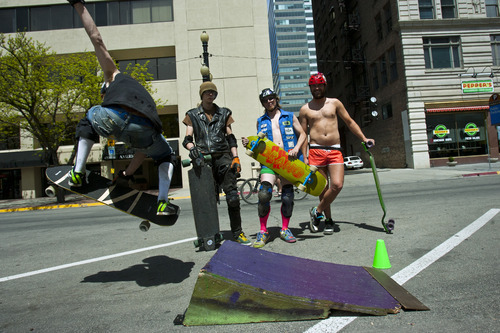 Chris Detrick | The Salt Lake Tribune Skaters pose for a portrait during Salt Lake City's Open Streets Festival along 300 South Saturday May 4, 2013. Chris Detrick | The Salt Lake Tribune "EK" skates during Salt Lake City's Open Streets Festival along 300 South Saturday May 4, 2013. Chris Detrick | The Salt Lake Tribune Bikers ride along 300 South during Salt Lake City's Open Streets Festival South Saturday May 4, 2013. 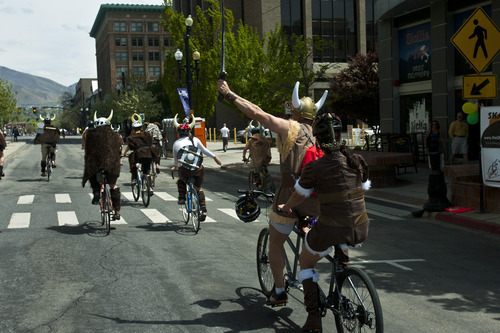 Chris Detrick | The Salt Lake Tribune A band of Vikings rides bikes along 300 South during the Tour de Brewtah Saturday May 4, 2013. 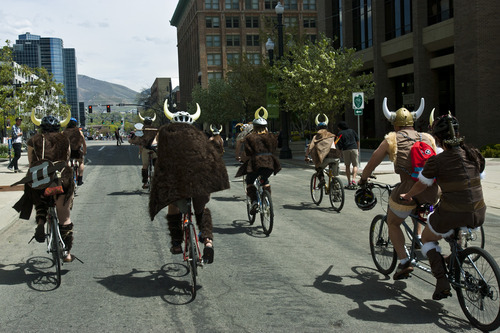 Chris Detrick | The Salt Lake Tribune A band of Vikings rides bikes along 300 South during the Tour de Brewtah Saturday May 4, 2013. Chris Detrick | The Salt Lake Tribune Bikers ride along 300 South during Salt Lake City's Open Streets Festival South Saturday May 4, 2013. 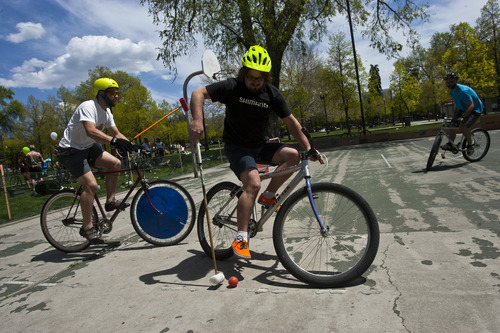 Chris Detrick | The Salt Lake Tribune A group plays bike polo during Salt Lake City's Open Streets Festival at Pioneer Park South Saturday May 4, 2013. 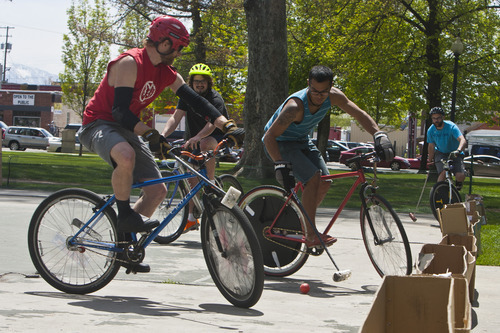 Chris Detrick | The Salt Lake Tribune A group plays bike polo during Salt Lake City's Open Streets Festival at Pioneer Park South Saturday May 4, 2013. 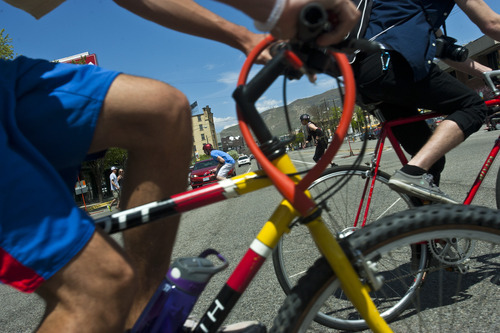 Chris Detrick | The Salt Lake Tribune Bikers and skaters ride along 300 South during Salt Lake City's Open Streets Festival South Saturday May 4, 2013. Chris Detrick | The Salt Lake Tribune Bikers and skaters ride along 300 South during Salt Lake City's Open Streets Festival South Saturday May 4, 2013. Chris Detrick | The Salt Lake Tribune A group plays bike polo during Salt Lake City's Open Streets Festival at Pioneer Park South Saturday May 4, 2013. They came on skateboards, push scooters, bicycles and roller skates. Some even walked. 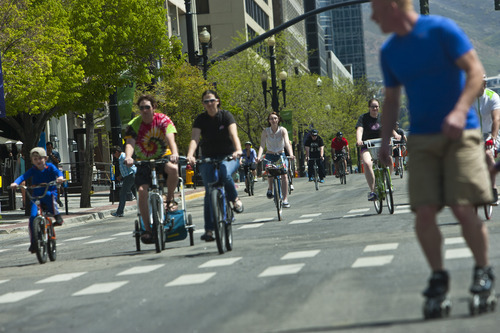 Hundreds of smiling faces brought a new kind of life to downtown&apos;s 300 South on Saturday as Salt Lake City kicked off its first Open Streets festival on a picture-perfect spring day. Broadway, as it is also called, was closed to auto traffic from 200 East to 600 West from 10:30 a.m. to 2 p.m. According to a statement from City Hall, "It is part of a national movement to temporarily open selected streets as public space for all to enjoy." And those who came out Saturday looked to be having a blast. Think fun and fitness, up and down the street. Erin and Jared Mendenhall brought sons Cash, 7, and Everett, 2, so the boys could ride their scooters up and down a street that is usually busy with auto traffic. "We love to ride our bikes downtown, and there are better bike lanes all the time," Erin said. "But to come down here as a family, it&apos;s great." 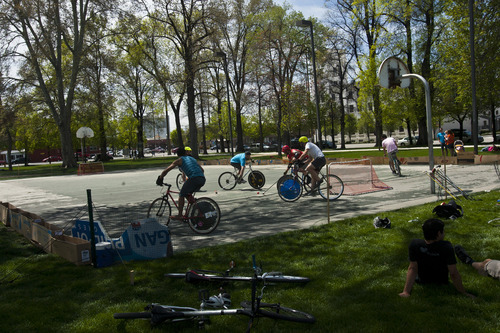 The festival attracted a lot of cyclists decked out in "Star Wars" costumes, declaring, "May the Fourth be with you." 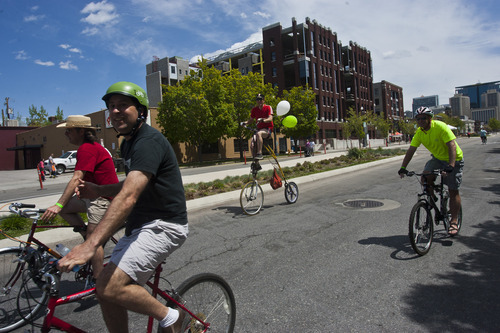 The Open Street fest coincided with Tour de Brewtah, a bicycle excursion that stopped at various breweries around the city. Many of the participants sported multicolored tutus. Eric and Kimberly Kraan were on hand from the SkateNow shop in Sugar House. They offer in-line skate rentals and lessons. "This is a great opportunity for people to see their city in a new way and to get in touch with fitness," Kimberly Kraan said. "I hope the city keeps doing this, it&apos;s really cool." Nic Latimer was riding a long (skate) board, while friend Candice Carpenter was astride a bicycle. The two were having a good time, Latimer said because he usually gets in trouble for boarding in the road. "I get yelled at a lot by police for riding in the street," he said. "But this is fun." City Councilman Kyle LaMalfa couldn&apos;t stay away. He was pedaling one of the city&apos;s new green Bike Share bicycles that were available Saturday without charge during the event. Other officials said they hoped this would be the first of many such fests. "I&apos;m delighted to see so many people out on bikes," he said. "Just seeing what a city is like without cars is transformative." Skateboarder Bryan McDonald enjoyed it so much that he would like to shut down auto traffic throughout the downtown business district. "It would be awesome," he said.